When we arrived a week ago, we were greeted by an empty field and a task: create a train that will take people and supplies into the yet-to-be-built Tinker City. It seemed daunting. Most of us didn't even know how to use the tools that would be required for such an endeavor. But over the course of the week, we learned, built, tested, failed, learned, built again, and kept trying. We looked up and, suddenly, we had an elevated train moving between two stations, filled with screaming and giggling tinkerers. It seemed like magic, but we all know there's no magic sauce here at Tinkering School, just more hard work. The results of our hard work make us very happy. We wake up, a little sad that this is our final day at camp. Milo sits on one of the benches outside the conference center and reflects on the week. Thankfully, a kind friend brings us bagels and a puppy! Just the thing to cheer us up. Collaborator Rhody is especially thankful for this furry friend. After breakfast, tinkerers get a little meta with the blog. It's time to pack up and clean up before families arrive. Junior Collaborator Gilon assists with the yurt cleaning. Now that that's all out of the way, we can have some fun. Che/Ultimate Warrior/Kid is the first to lead us into it. We take turns getting pushed by Conductor Gever while we wait for families, making sure the train is still as fun as we remember it being. We can't wait to show off our hard work to our families, and they're just as eager to test it out for themselves. Even the adults get in on the fun. And we show off our sky bench, and the wonderful view it provides. Everyone's having a blast, and what's not to be happy about? Happy reunions include showing off our side projects. Raquel made a pair of stilts, and she makes it all the way from Terminus to Midway and back, with a little bit of assistance. Should we go faster? Gever and Julie say yes. Faster, it is! Collaborator Caroline rushes the Tinker Express back to Terminus Station. Success! The crowd goes wild as they roll on down to Midway. Down at Midway, after a full morning of perfecting the technique, Collaborator Kevin has her catch-and-release form down. After most of the families have left, the collaborators get a little more daring. How fast can we go? Gever and Gilon decide to put some extra pepper on this one. Gilon zooms down the track, gleeful to find that the cart and tracks built by 9-year-olds can really fly. We all hear a crash and rush down to Midway Station. The catchers at Midway couldn't stop him before he hit the emergency bumper at the end, and we find out that our emergency bumper maybe needs a little bit of work. We're happy to have finally caused a failure on the impressively strong system, and glad that no one was hurt in the process. We decommission the train for later reconstruction. The collaborators take a moment to pose for their adoring fans. After all the tinkerers have said their goodbyes and "see you next year"s, Elkus Ranch is strangely quiet. No power tools whirring, no hollering from the parking lot from chaos tag, no thuds of chance cubes deciding fates. The train sits motionless on the track. We imagine everyone is still smiling from their car rides back to their homes, while collaborators are smiling as they finish up the last jobs at Elkus. It was a magnificent week. 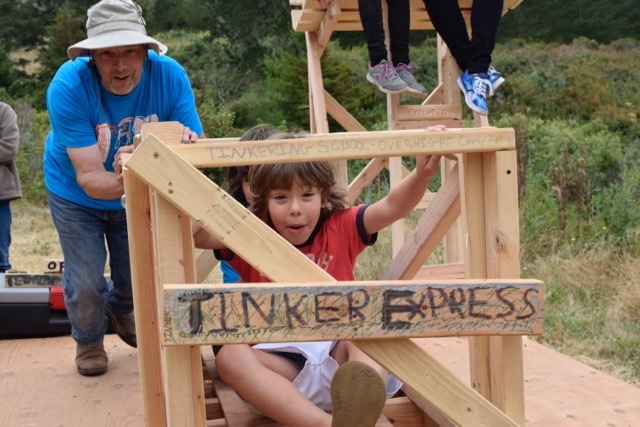 This week was most campers' first time at a Tinkering School camp, so there's a chance they weren't aware of just how amazing their feat was. This was a huge undertaking, and all of the adults involved were blown away by the dedication, innovation, and hard work that everyone put in to make this grand vision an even grander reality. I had a parent ask me, quietly, "So, how much of this did the kids actually build?" I grinned, and responded, "All of it. The collaborators (adults) just helped." And it's true. The campers this week drove all the ideas and decisions, as well as the saws and screws into wood (unless height was an issue). We're so excited to have had such a perfect start to the summer. Our train has reached our new town, and for the next seven weeks, we will build off of this great momentum to create Tinker City. Stay tuned next week!